In 3.15 Time Is on My Side Rufus mentions England when discussing with Dean about determining identity through ear prints. RUFUS: Of course, that don't fly in the courts over here, but in England, they're all over it. A friend of a friend...of a friend faxed me 10 pages of confidential files within a day. All I had to send him was one clean shot off the security camera. 6.01 Exile on Main St. Samuel mentions The Mayflower, a ship that bought the Pilgrims from England to North America in 1620 Samuel: You know you had ancestors hacking the heads off vamps on the Mayflower. During 6.04 Weekend at Bobby's Dean and Sam travel to Scotland, as a favour to Bobby. They find Crowley’s grave and dig up his bones, threatening to burn them to end Crowley once and for all unless he does what Bobby requires. 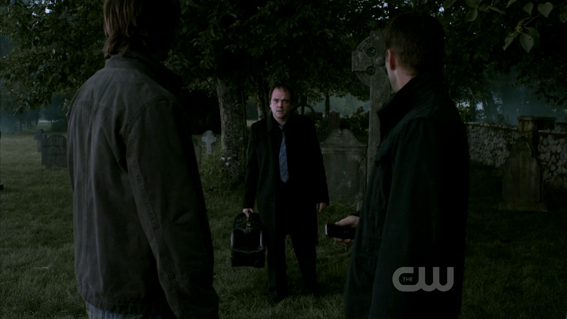 Crowley appears in Scotland moments later, where Sam and Dean are still standing over his bones. Dean threatens to burn the bones anyway, but Sam tells him to stand down, saying "a deal's a deal." Crowley picks up his bones and disappears, and Bobby thanks Sam and Dean for flying to Scotland and helping him get his soul back. During 6.09 Clap Your Hands If You Believe Marion talks about Avalon: Marion: Personally, I think they're taken to Avalon to service Oberon, king of the faery. - Avalonis an island in England that features prominently in Arthurian legend. In medieval and Renaissance literature, Oberon is king of the fairies and is most known nowadays as a character in Shakespeare's play "A Midsummer Night's Dream." In the Episode 7.21 Reading Is Fundamental Dean and Castiel play the board game Sorry!, which originated in England in the 1920s. It is based on the ancient Indian game of Pachisi. Players draw cards which direct their movement around the board. One player's movements may result in another player being sent back to the Start - hence the title of "Sorry!" British Men of Letters in Season 12.